Last week I had mentioned that I had started tracing off another view of Jalie 3245 – the racerback, tunic-length tank. Today, I have a new dress! This was another style that comes together very quickly. I didn’t time myself, but I’m sure that I completed it in an hour (cutting time not included). Speaking of cutting, I changed up the look of the binding on this one and cut them on the bias – this definitely gave the stripes a more interesting look when placed around the neckline and the arms. The fit is great and the tank is extremely comfortable. The final length is fairly short, so if you’re the least bit tall and you plan on wearing this as a dress, I would suggest lengthening it to a size that you’re comfortable with. I can definitely see making more of these, but I’ll probably go for a few of the shorter versions so that I can wear them with my favorite shorts. This entry was posted in Uncategorized on July 17, 2013 by stacy. Well, I’ve done it. It’s been ages, but I couldn’t resist…. that’s right, I’m doing a Craftster Swap. The Spell My Name Swap isn’t new to me, however, this version is much shorter – only concentrating on the initials of a person (3 total projects). The best part about any swap (IMHO) is the ‘stalking’ (looking through Pinterest pages, blogs, forum posts) and the planning that is involved with it all – I honestly come up with my most creative ideas from this process! So, hold onto your hats for some fun, unique items in the next couple of weeks – I’m excited to get started! This entry was posted in Uncategorized on July 16, 2013 by stacy. Have you ever made something so ‘fun’ that it calls for a special setting or props to ‘make’ the photo? That’s kind of how I feel about my finished bombshell – it’s such a fun, retro look that I felt like I had to do victory rolls, don a big flower, and put on my reddest lipstick. So now that the suit is done and photos are taken, let’s talk about the construction of the suit! Let me start off by saying, that this suit is vastly different from anything I’ve worked on before, but I think that the directions simplified it enough so that almost any level of sewist (advanced beginner and on) could work on it. One of the elements that makes this look so flattering is all the ruching, however that means one thing – LOTS OF BULK. I stayed away from serging this project just because I was afraid that it would be even bulkier and that my machines somewhat dulling blade would chew up my garment and I’m glad that I did. I even found myself having to unpick several seams (my own errors) and was happy that they weren’t the 4 thread serged ones! One thing that I wasn’t prepared for was the amount of elastic that was used – since I knew I had some on hand, I never paid attention to how much was called for (about 4 yards)… and I used every bit of what I had (if you’re wondering what takes up so much all the hems have elastic in them). 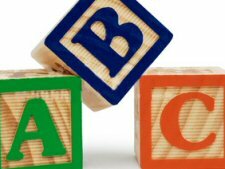 Don’t assume this is a typo – you really will use that much! I cut an 810 (it was a meld of the two sizes really) for the top portion of the suit and a 10 for the bottom and I think that the fit is incredible. The neckline, gathers, and length are really flattering to the body – I just love it! This entry was posted in Uncategorized on July 15, 2013 by stacy. 1. Center ribbon on one side of webbing. Glue (or sew) in place. *If gluing be sure to let ribbon dry before proceeding to next step. 2. Fold webbing in half, wrong sides together and raw edges even. Place both ends inside open end of hardware. 3. Using pliers, pinch ends of clamp together until closed and webbing does not slip out of hardware. 4. Slip slit ring through hardware loop. TaDa! You’re done! It’s easy to make and fun to receive (and I have to admit that I love the mustache version an awful lot)! This entry was posted in Uncategorized on July 12, 2013 by stacy. With just a few measurements and 2 rectangles of fabric, you can make this super easy two strip top! Who says duffel bags have to be for boys? This quilted version is definitely a pretty version you can take on a road trip or the gym! If you’ve been spending lots of time at the poolbeach, chances are your little one might be ready for a new suit. This tutorial has the pattern & instructions to make a new, basic suit! Who says shoes have to be boring? Match your laces to your next garment! Bike baskets don’t have to be just for the grownups. The Valencia Street Bike Basket is mini sized (and the photos are adorable). Keep your sunnies safe and stylish with this gathered sunglasses case tutorial. Two years ago, I went on a casserole carrier sewing binge – they were so fun to sew… and now I think I’ve found a new one I’d like to try. This carrier isn’t just cute, it has a great name – The Hot Mess Casserole Carrier. No matter what shirt you use, the end results of this tee-to-tank tutorial will be adorable. 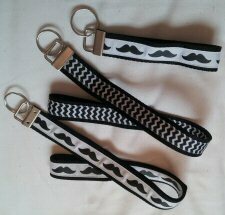 Mustaches are still very popular. Keep up with the trend and carry a little one on your key chain! Stop dragging all your supplies to your ironing board, make this thread catcher & caddy instead! An oldie, but goodie, The Buttercup Bag. A great fat-quarter-friendly project! A simple, yet sweet project for your little one: The Pal Pocket pillow runner – just the right size for books and stuffed animals to be stashed at night! This entry was posted in Uncategorized on July 11, 2013 by stacy. I decided to use a blue and oatmeal stripe cotton jersey that I picked up in my latest Girl Charlee order – for $3.85yard, I couldn’t resist this cute material! For this project, I decided that I’m going to skip the pockets and cut the binding strips on the bias to give the finished garment a little more interest. This entry was posted in Uncategorized on July 10, 2013 by stacy. Since my thumb injury is setting me back on the Bombshell gathering, I decided to make something from my latest book acquisition, Drape Drape 2 . I decided to start with “One piece side draped top”. Let me start off by saying that the sizing in this book ‘runs small’ (by American standards) – my measurements puts me into the XL category (‘big 4’ sizing puts me into a 10/12 typically). However, there is enough drapeease with these patterns that am fairly certain that I won’t have to make too many adjustments. The patterns for all the designs are included in the book, but be prepared to trace your pieces onto very large tracing clothpaper (since many of the clothing views are one and two pieces, you will likely have to join multiple pieces together to make one pattern piece so you can imagine how large that can get!). Because I wasn’t sure about fitsizing on the top, I decided not to cut into my ‘good’ fabric and used something in my stash instead – a pretty stretch meshonionskin material. 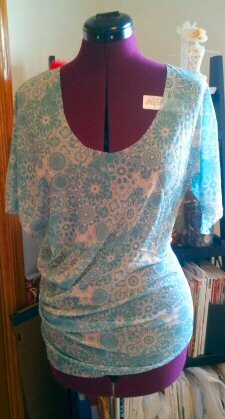 I have to admit, the construction of this top is super easy (the hardest work is really tracing off the pattern) and the fit is fine (I did increase the neckline by several inches because it is very LOW). However, I’m not crazy about my material choice… this pattern really does look fabulous in a stripe knit- overall design is lost on the mesh print. Stay tuned for a new, updated version soon! This entry was posted in Uncategorized on July 9, 2013 by stacy. 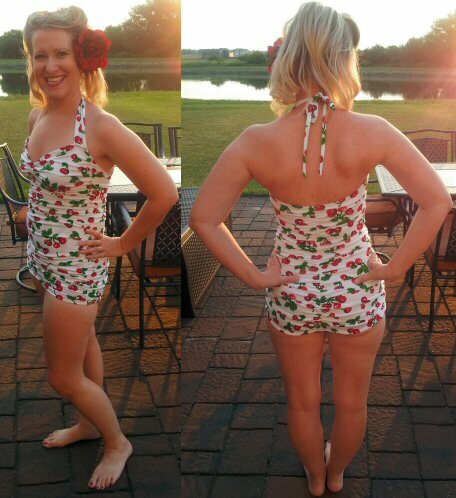 I am happy to report that my yard of fabric was just enough material to make (view A) the bombshell swimsuit! I spent the morning cutting then dug into the instructions – the photo on the left is what I have so far. Right now there is lots of gathering involved which isn’t just time consuming, it’s killing my (4th of July sparkler burn injured) thumb! I’m thinking that I’m going to have to set this aside for a few days until it isn’t quite so sensitive (and ‘gooey’) and work on something else in the mean time. I will say, I’m completely giddy about the prospects of this suit. With all the gathers and the length itself, I can see how it can be ‘figure flattering’, plus the retro aspect of it has me thinking of all sorts of ‘photo shoots’ I can do with the completed look… even my teenage daughter thinks it’s awesome! This entry was posted in Uncategorized on July 8, 2013 by stacy. I hope everyone had a wonderful, safe holiday! 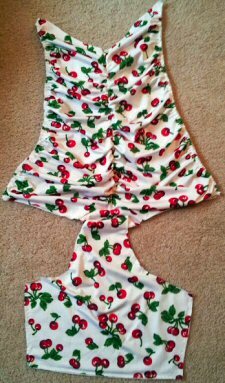 Now that the fireworks are over, it’s time to settle into a new project – how about my latest over at Bernina’s WeAllSew…. 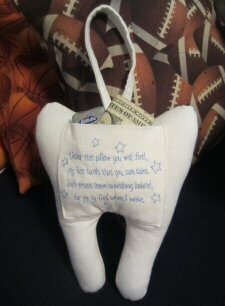 a tooth fairy pillow? With wiggly teeth right around the corner, we’ll soon be putting this little guy to good use. It’s a fun, tooth shape cushion that can be hung on a door or bed (I prefer the door so the ‘tooth fairy’ doesn’t wake anyone up when retrieving their treasure). It also sports an over-sized pocket that’s the perfect for storing your child’s tooth and has plenty of room for coins, cash, or even some dental floss! Best of all, it works for both a boy or girl and can be made with or without embroidery. I can’t wait to see everyone sewing this one up! This entry was posted in Uncategorized on July 5, 2013 by stacy. Every year, when a holiday falls on Linky Thursday, I struggle with the decision to post it on that day or wait. Since we’ve already begun holiday preparations at our house this morning (i.e. lots of food and fireworks) as I am sure a lot of other Americans are doing, I’ve decided to postpone linky goodness until tomorrow! Have a wonderful and safe 4th of July to everyone celebrating and I’ll see you all tomorrow! This entry was posted in Uncategorized on July 4, 2013 by stacy.